Alex Tuch has impressed in the AHL this season, registering 22 points in 34 games. 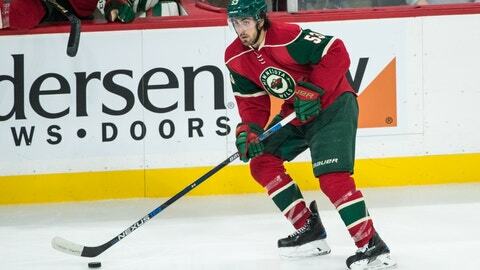 The Minnesota Wild have recalled forward Alex Tuch, paving the way for the 2014 first-round pick to make his NHL debut Saturday against the Vancouver Canucks. A veteran of the U.S. National Team Development Program, Tuch spent two seasons at Boston College before signing with the Wild in April, scoring 62 points in 77 games (32 goals, 30 assists) for the Golden Eagles. Tuch has impressed as a rookie in the AHL, registering 22 points (11 goals, 11 assists) in 34 games for the Iowa Wild, and ranks second on the team in scoring. Tuch scored twice in his most recent outing with Iowa, helping the Wild to a win over the Rockford IceHogs (an affiliate of the Chicago Blackhawks) and stretching his goal-scoring streak to three games, before playing in the AHL’s All-Star Classic on Monday.